(Oregon Coast) - Along what's nicknamed the "corridor of mystery" (really the Nestucca Valley) - that dark tract of steep, winding road and dense trees between Lincoln City and Pacific City - sits a mystifying yet resplendent secret little village that seems to eternally defy change or progress in any great surge. Neskowin is nestled in the midst of this forest and sweeping, soaring hills, as if it's hiding from the world, resisting its influence of growth, of hotels, big eateries or cotton candy-makers. 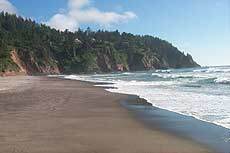 Instead, since its meager (but suspect) beginnings in 1876, Neskowin has remained this sleepy place with almost nothing but a pristine beach. Well, almost nothing but beach. Then again, there's much more to this beach than meets the initial glance, including the legendary "ghost forest." Play around this ethereal little place just once, and you'll agree there's something vastly different here. My first impression of it took that to new levels. I call it part of my own "personal X-Files." It was 1987, and I was dating this amazing beauty for about a month - exactly a month, actually. It was the second full moon and Friday the 13th in a row. This was weird enough. But Christine and I were celebrating our one month anniversary together (we'd hooked up on the prior full moon/Friday the 13th). She and I joined a group of friends at their beach cabin at Neskowin about 1 a.m. We immediately hit the beach, and serendipitously, we found a big bonfire still burning - as if waiting for two star-crossed lovers. We chatted and sipped champagne beneath a cloud cover so thick the moon was not visible, with the dark surf burbling not too far away. At one point, I noticed something odd in the darkness. There was a faint, undulating patch of red on the horizon, apparently on the water. It was as if something was glowing from beneath. It didn't look like anything was casting the glow from above, as the moon wasn't to be seen, and it certainly wouldn't have looked red. Whatever it was, it must've been huge, and it kept changing shape. I thought I was seeing things, but finally pointed it out to Christine, and we spent the next half hour staring at it, trying to figure it out, with theories about UFO's and whatever just flying. Just as we began zipping up the foredunes to the cabin to grab our friends, it disappeared. They simply laughed at us when we told them. Ten years later, I talk about this with an expert on glowing phytoplankton from Florida - and had already discovered this couldn't have been a fishing boat. She said there is a brand of glowing critters known that glow in red, but these waters are too cold for that. The rest of her response still chills me to this day: "There's still much out there we don't know about." At MP 98, the picturesque and engaging village of Neskowin is largely comprised of a few condominiums, two golf courses, a couple of businesses and a smattering of charming and even posh little homes. 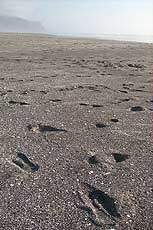 The beach is really the real top bill here: a nearly never-ending promenade of sand. But because of Neskowin's relative isolation, it's a treasure trove that's usually not very crowded. From the parking lot it's a short walk to the beach and its slightly unusual dark grains of sand, plus enough driftwood to make yourself a decent fire. 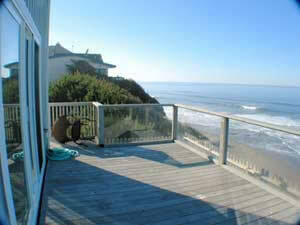 Upon entering the main beach access, you'll see a lovely little stream winding down to the ocean. The highlight here, of course, is Proposal Rock, which greets you on first sight upon entering. Proposal Rock is the intriguing blob-like structure sitting in front of you, boasting a small forest sitting on top. There's a sizable creek between you and it, however, and to get to the structure means crossing this cold body of water barefoot. Atop the rock, there are some hidden trails meandering through the forest where the views are somewhat legendary. Watch the tide closely or you could get stranded, and be careful of the trail's slippery entrance. 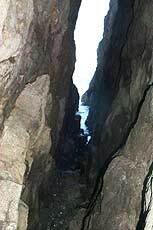 There is a tiny cave-like crack in the structure, providing a peek to the ocean. Near the entrance, look for a small, round brass plaque, an oddity embedded there early in the century. 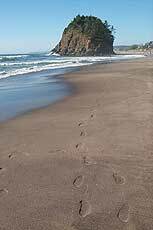 Mostly, Neskowin is one giant beach, with sands running northward uninterrupted from the bottom of Cascade Head, through Winema Beach, to the edge of the Nestucca Bay - about five or six miles. Funky features and colors populate the very southern end, the cove-like area which bumps into Cascade Head. One of the trails atop the headland skirts Neskowin, providing incredible views from above. The word "Neskowin" is tribal language for "plenty fish," because of the area's abundance of the slithery ones. One historical anecdote talks about a creek here so full of fish one summer in the early 20th century that the waters were black. The original residents were natives, of course, and they weren't treated nicely when they were booted from the spot. The initial name given to the place by settlers was Slab Creek, with the first homestead created there about 1876. This was only after years of the area being used as an Indian reservation. In order to allow homesteaders, the U.S. government herded them somewhere else again, moving them to the mouth of the Salmon River. Fishing was the village's only industry for years, then lumber for a time. Meanwhile, it never grew beyond a smattering of homes. 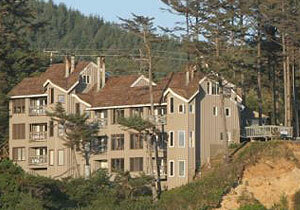 One hotel - Neskowin Hotel - was built around 1895, but was nearly washed away. It was later moved a little more inland, by blasting a spot out of the hillside. 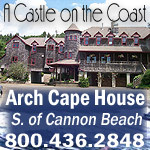 Proposal Rock Inn stands in its place now. Other hotels showed up the late 1940's. 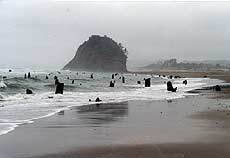 Proposal Rock was named after Charles Gage proposed to Della Page on it around the turn of the century. Della's mother, Sarah Page, so named the rock. The first golf course was built in 1930, a year after electricity came to Neskowin. The road that later became Highway 101 was built in 1910. Somehow - primarily through the insistence of residents - Neskowin has hardly changed over the years, although now homes are slowly popping up all over. Still, no major development in terms of hotels and tourist traps are happening, and it remains this dusty gem in touristy terms. Another highlight is the proliferation of ancient tree stumps - nicknamed the "ghost forest." This downright spectacular oddity is almost a rare sight in Neskowin, but you may not know just how spectacular it is unless you know what it is you're looking at. They look somewhat like old, ragged pilings leftover from something manmade - but they are, in fact, stumps of a forest some 2,000 years ago or so. As many as 100 are sometimes visible in various shapes and sizes. It's theorized that around 2,000 years ago a massive, cataclysmic earthquake abruptly dropped this forest possibly more than 25 feet. Then, somehow, they were preserved by sand and mud, rather then being destroyed and scattered, as natural erosion might've done. The theory is that either a tsunami brought the sand in or the earthquake rattled up so much soil and sand it covered the forest. 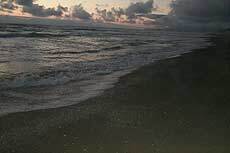 The other dynamic here is that these were obviously lopped off by some enormous force - which scientists believe is a tsunami either immediately after the initial event, or one such as the wave that wiped out these shores in 1700. There are similar stumps periodically visible near Newport, although these are quite rare. One, however, is consistently visible sticking out of a cliff in Nye Beach, just beneath the Sylvia Beach Hotel. Most of the westbound streets along the beachfront area are named after other Oregon towns, like Salem, Monmouth and Corvallis, etc. Ride the street running alongside the beach, and about a mile north of the first major curve you'll find a hidden beach access, cloistered well between a couple homes. Even before the big curve, there are some accesses that are unbelievably beautiful - and devoid of people. 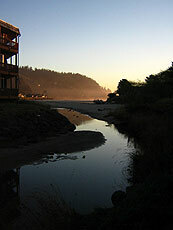 This northern end of Neskowin is different from the more populated section by the main access. There's something more mystical going on here. 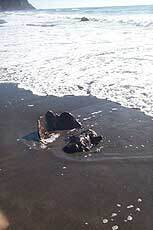 Perhaps it's the darker sands near the tide line, which plunges rather abruptly into the surf, making for more spectacular wave action. Or maybe it's the different quality of the sand here: the grains are bigger, coarser and there's an interesting propagation broken seashell bits. This is no ordinary Oregon beach. 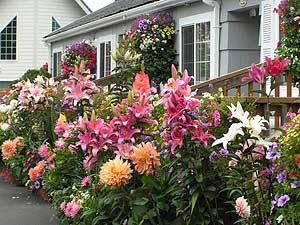 It's a rainy, dark day in spring 2005, and I discover some of the backstreets of Neskowin. 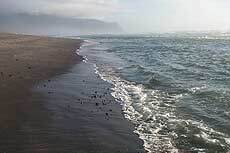 Near a lodging called The Breakers, I pop out onto a strange beach of black sands, where a flat patch sits at the top of a somewhat steep tide line. Normally, this would create some rather intense wave action, but the high tide and stormy weather causes the waves to dart up on the flat section, then dart back. It's odd, but beautiful. Not a normal beach. Plus, there's such a sense of peace here, coinciding with the awe I feel. For the first time in my life, I experience something I could only describe as spiritual. Weeks later, it's summer and I tread to the very northern end by the secret access. Again, I feel that transcendent, metaphysical tranquility - but more profound. I find this strange, not just because I'm a science geek, but because of the area's mistreatment of the natives in the past. They were ousted by white folks rather abruptly. You'd think there would be an opposite vibe. But not here. I can't explain it. There is simply some mystical and extraordinary quality to this part of Neskowin. It's not just because it's completely devoid of crowds. And others I've talked to about it have verified this feeling. In fact, in a conversation with Oregon Coast Aquarium's Cindy Hanson, she brought it up before I did. I recall my first experience with the mysterious, glowing red blob on the sea. I can't help thinking there's more to this beach than meets the eye. Indeed, I am certain of it.